Earlier today, the Obama administration released “Fact Sheet: An Enduring Commitment to the U.S. Nuclear Deterrent” on its revised ten-year plan to modernize the U.S. nuclear weapons stockpile and infrastructure. The new (and classified) plan updates the ‘Section 1251 Report to Congress’ released this May. As we previously noted, the revised plan includes an enormous $4.1 billion increase when compared with the original plan. As the Senate debates whether to consider the treaty, we provide a comparison between the original plan and the latest update. 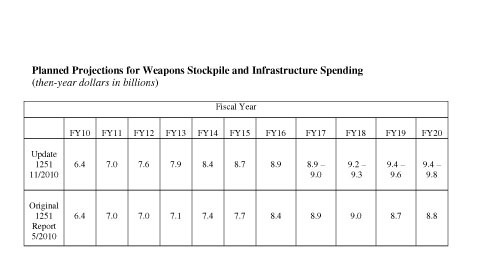 Bottom line: the figures indicate the administration is expecting an additional $1.5-$2.3 billion will be needed for the weapons complex on top of the $4.1 billion already announced. The White House fact sheet states that this new budget pledges more than $85 billion for nuclear weapons over the next decade. Of that amount, roughly $14 billion — $10 billion in May and $4 billion now — is planned new spending on the complex, increases above earlier planned spending levels. That makes this latest increase serious money, adding 40% more to the May increase. In FY2012 alone, the increase doubles what was proposed just six months ago. That is, they asked for $600 million more for FY12 in May, and now another $600 million on top of that. The fact sheet also highlights that, of the $4.1 billion increase, $315 million is for the Uranium Processing Facility (UPF) in Tennessee and the Chemistry and Metallurgy Research Replacement Nuclear Facility (CMRR) in New Mexico over the next five years. This is on top of the $1.2 billion that the administration already plans to spend on the CMRR and $884 million on the UPF over the next five years. That’s a significant chunk of change, especially when we don’t know if actual construction will begin in the next five years. The “additional costs” are listed, but without comparing them to the original figures from May, you can’t tell what they are. The chart below provides that data. In short, from FY2017 to FY2020, an additional $1.5 – $2.3 billion is proposed. It is also worth noting that the comparison only reveals an additional $3.9 billion in the first five years, rather than the $4.1 billion the fact sheet declares. It is unclear if this is a simply rounding difference, or if another $200 million has been pledged. It might be that extra money is in pension plans, often cited as one of the items included in the increase (and something that Sen. Kyl has specifically requested). Historically, this is the most money that has ever been spent to maintain the nuclear weapons stockpile, not just since the end of the Cold War. It is hard to believe that advocates of increased spending on the complex could ever get a better deal. If the Senate does not act fast, the consensus allowing this increase could easily fall apart, and all the new money disappear.